Integral marks the importance of Consumer’s Rights for the Tech savvy Nation. World Consumer Rights Day observed globally, on 15 March every year was celebrated at Integral University auditorium for the awareness and solidarity of the consumer movement. The theme for World Consumer Rights Day 2019 was ‘Trusted Smart Products’. “All of us are consumers and this World Consumers Rights Day is to highlight what consumers want and need from a connected world and how important it is to put them at the heart of the development of these digital products and services. From smart phones to wearable fitness trackers, to voice-activated assistants and smart TVs, many of the products we use are increasingly becoming connected by default, so knowing our Online/smart products Rights, becomes even more important” voiced Professor Syed Wasim Akhtar, Chancellor, Integral. Justice Vijay Verma, Former Chairman Consumer Forum, Lucknow emphasized on the fact that we must approach a consumer forum when in need. “Only about 100 Rs court fee, just the receipt and the written complaint are all what you have to put in to take your case to the court and in justice to the consumer to end ” he validated. 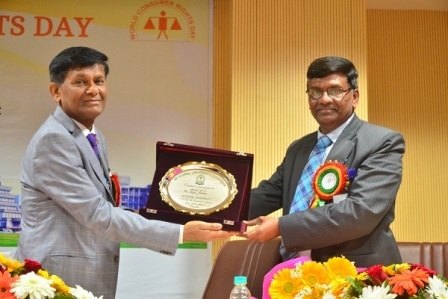 Justice Raghvendra Kumar, former Judge, Allahabad Court was present as the Chief Guest to the occasion briefed the audience with the magnitude of technology and the awareness required. “Smart products are connected to the internet and receive, collect and send data. Globally, there are currently 23.1 billion smart products in the world, outnumbering people three to one. As more people come online across the world and our connection to the internet becomes better and faster, smart products will become more of a day-to-day reality for consumers everywhere, marking a major change in the way many consumers interact with products and services” he said. Shri Shambu Nath Shukla, IAS, Additional Chief Secretary, the guest of honour enlightened the faculty and students present at the auditorium with the basic Rights of consumers. “The right to safety, to be informed, to choose, and to be heard are the basic Consumer Rights. The International Organization of Consumer Unions has added four more rights: the right to redress, to satisfaction of basic needs, to consumer education and a healthy environment” he added. The successful and informative celebration on the World Consumer Rights day was organized by the Faculty of Commerce & management. Professor Anoop Saxena, Dean, Management & Research is his profound address pointed out that it is not the customer , but the consumer, who is the real King, as Consumers of the present day and age are well aware of their Rights, and such days like today’s reinforces the slogan “Jago Grahak Jago”.